Due to the growing global demand for products and materials, companies are forced to cope with a depletion of critical resources. To meet the challenges ahead they need to explore new ways of delivering value and fulfilling people’s needs by proposing new and more sustainable ways for users to consume their products and services. To help do this the Circular Economy was conceived. The Circular Economy is a concept for an industrial model in which resources are perceived as renewable flows of materials and is characterized by minimal loss of quality and the elimination of waste. In this model companies are encouraged to retain ownership of their products, contemplate product/service shifts (where applicable) and reduce cycles of disposal through mindful and human-centered design. Doing this will result in ways to create more value with the same amount of resources. For small/medium companies who are interested in exploring new ways of creating sustainable value, Moonfish is the strategic partner that provides different perspectives on your current business and together with you, identifies opportunities for the future through the development of circular economy capabilities within your company. At Moonfish, we aim to support companies in the process of conceiving competitive ways of delivering and retaining increased value; and we believe Circular Economy is the way to achieve this. Along with a distinctive design attitude and commercial empathy, we encourage companies to develop products and business practices that place the users, resources and key partners as strategic means to provide improved value propositions. Finally, we strive to leverage your skills, strengths and expertise to demonstrate how to accomplish a superior long-term performance. At Moonfish we believe in the power of a collaboration, in which you act as the initiator of a transformational and invaluable process that will secure a place for your company in the future. In our way of working, we start from your desires and needs to grow as a company, as they will set the starting point of the process we will go through together. Here, we use our background as designers to generate a refreshing perspective on your business and identify opportunities for the future. The design methods and tools we use will help map the different components that are involved in your business from a human-centered perspective. From our experience, the existing customer-company relationship is mostly linear, meaning that the company provides value for the customer in the form of a product which will not be returned to the company once the product is discarded. By applying our model, we aim to turn this relationship into a circular one, in which the traditional consumer becomes a user and delivers value (in the form of a product) back to your company. In the first phase, we will analyse your current situation, together with you, in order to gain a deep understanding of the specific challenges for your company. Next, we will enter the ideation phase where we map all the components of our model in order to explore all the circular possibilities for the last phase: synthesis. The outcome of the last phase is an improved value proposition for your company and its users, with a focus on making the relationship circular. This will help you achieve a sustainable advantage for the future. Circular Economy aims to design out the growing waste generated in our consumerist society, to create an economic model in which waste does not exist. Products will be designed and optimized to be easily repaired, disassembled and reused, which reduces waste greatly. The linear term of consumption is replaced by usage. This calls for a new relationship between companies and the users of their products, often based on increased product performance and longevity. The Circular Economy is built on cycles that return the energy and value that is embedded in products back to the company. This is accomplished by four different cycles which are linked to four activities, namely maintenance, re-sell, refurbish/remanufacture and recycle. Since shorter, inner cycles involve activities that require the least effort and have the fastest return of resources, they will offer the most potential for saving materials, labour and energy. The matter of which cycle to implement depends on the product that is delivered to the user. Within this circular model, partners should be involved in the process in order to build a network of companies who in collaboration execute the actions that are required to go through the different cycles. 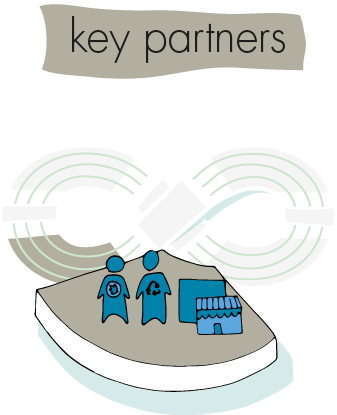 In each cycle a partner will deliver value back to the initiator or the users. The circular business works in two ways: for the user, it will result in products with an increased longevity and lower maintenance cost; for the company, it will improve their margin and cost-competitiveness. But most important, a circular business model will help to prepare your company to be profitable on the long run and thus create sustainable value for the future. To achieve this, we have developed a circular business model tool that we use in our workshops. The tool is based on Osterwalder & Pigneur’s Business Model Canvas and the Ellen MacArthur Foundation’s Butterfly Model. Our model takes after the infinity symbol, in order to emphasize the ongoing process of circular business (it never ends). Smaller cycles require less time, money and energy. Click the image below for a high resolution printable version. The value of the Circular Economy is embedded in each of the four cycles previously mentioned. Below you can find a more elaborate explanation of these cycles. Maintenance is a service offered by the company who is selling the product. When taking the maintenance aspect into account while designing, product performance is enhanced. This benefits the company since products would demand less maintenance. In addition it has a positive effect on users, since well-functioning products imply less worries about failure or replacement. Maintenance is the first and most inner cycle of the Circular Economy model, therefore it has the most potential for saving energy. It should be user focused in order to reach high results (value for the user) and thus high profit. On the other hand, maintenance could also be seen from a different perspective, where products are designed to be easily repaired by users themselves. Reuse or re-selling means that a product can be used again for the same purpose; preferably in its original form, with little enhancement or change. Because the circular model is based on the reuse of resources, we call this specific cycle or process re-sell, in order to avoid confusion. The re-sale of products is the second inner cycle and provides profit because products are meant to be back on the market, with the least amount of time and effort invested by the company before it can be reused. Re-sales save on materials, energy and labour costs. Gathering products in order to re-sell them should be executed at local or regional level, which will cut down logistic costs. Refurbishing is a process of returning a non-working product into a good working condition, by replacing or repairing major components that are damaged or close to failure. This is also accomplished through different processes that enhance product appearance, such as cleaning or embellishment. Remanufacturing is a process of disassembly and recovery at the sub assembly or component level, where functioning and reusable parts are taken out of a used product and built into a new one. Refurbished and remanufactured products can be sold at a lower price, which can generate an additional profit for companies while at the same time reach different users and enter new markets. To give an indication of the market potential; in 2011 the US exported a total value of 1.5 billion dollars as a result of refurbishing or recylcing products. Products that are exhausted in terms of the possibility for remanufacturing, refurbishing or upgrading can be recycled. When recycling, resources that are at high risk of depletion can be reincorporated into the cycle in the form of input material. Resources such as crude oil, copper and chromium have high risk of depletion by 2050. Recycling will keep these materials available for new purposes. This is George. He is excited about the Mud Jeans brand because they offer high quality jeans that are almost 100% recyclable. Next to that they offer him an interesting way to lease (instead of purchase) their apparel, which comes with additional repair and exchange services. George is very attached to his jeans but after 8 months of heavy use, he discovers that the zipper is not working properly anymore. He is sad because it is his favorite pair and now he can not wear it anymore. Because his Jeans are Mud Jeans there is a service linked to them; the manufacturing company will repair the jeans when they are damaged. He can continue wearing his jeans for as long as possible, up to the point where they can no longer be repaired and the jeans are returned to the company for re-manufacturing or recycling. When George ultimately returns his jeans, the company may resell them, remanufacture them into something different or recycle them into fibers for new jeans. Because of this, most of the jeans’ initial value is retained by the manufacturer so it can be applied again, which lowers the company’s input costs. The company also gains a more loyal relationship and more personal interaction with its customers. Because the jeans manufacturing company has a deep understanding of the benefits of Circular Economy, they focus on their core competences of providing high quality products and services. To accomplish this, the company has set up partnerships with other businesses that are great in executing, for example, maintenance or re-manufacturing activities. This is the place where George’s jeans are taken. George is a young professional and denim enthusiast. He bought his new jeans at a retail store that stocks the Mud Jeans brand. His pair of jeans is somewhat special because it provides him with a couple of options during its life cycle. After George returns his pair of jeans at a retail store, they are taken to a place where the jeans are inspected. George’s jeans need a new zipper, so they are labelled with the word maintenance (there are more labels available depending on the current state of the cloth piece, i.e re-sell, re-manufacture or recycle). Once George indicates his preference for repair, the jeans are sent to a maintenance facility from a different company that is working together with the jeans manufacturer. In the described situation, George’s jeans are seen as resources returning to the company. Here, the product is making a small loop and will return as fast as possible, with the least amount of energy and money invested. Then it is returned to the user. When the jeans are labeled for recycling, the company can recycle them and gain back the initial raw materials as valuable resources. At the maintenance company, they are very good in replacing zippers. George receives an e-mail within 24 hours, saying that he can pick up his repaired jeans at his local retail store. How can you turn a future threat into a strength that will create sustainable value? How can you as a small or medium sized company, or starting business survive the fierce competition? How can you use the increased scarcity of resources to your advantage? It might seem difficult or even impossible, but there is a way to achieve it. This is where Moonfish comes into play. 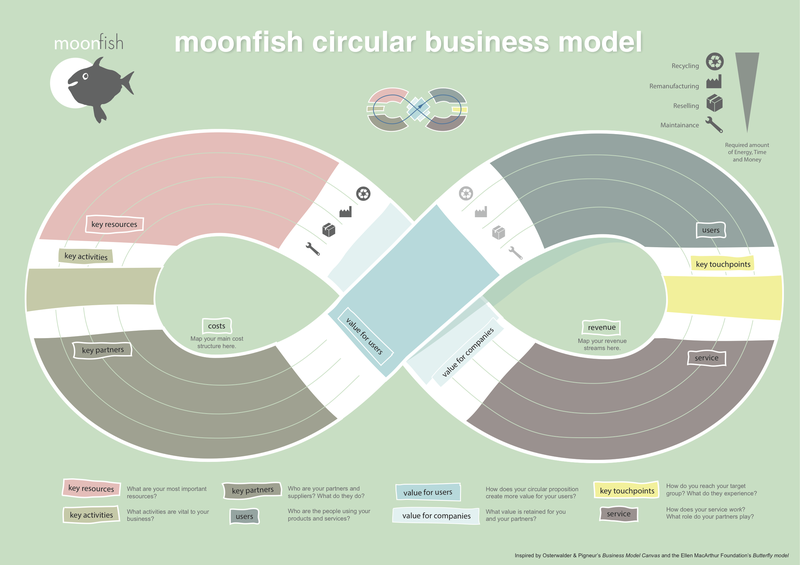 Moonfish is the strategic partner that can help your company create a circular business model that will allow you to maintain or even win ground in the future. By combining your strengths and key resources with our design attitude and expertise on Circular Economy, we can achieve great things for the future. In the face of the uncertain future concerning resources, companies are forced to look for other options. By turning the current linear relationship between your company and its users into a circular loop, resources can be reused and the company-user relationship can be strengthened. Besides creating more value for you and your users, we can together work towards a better future and create partnerships in which everyone benefits from being circular. But what exactly does Moonfish bring to the table? By using our design attitude, we can provide you with different perspectives on your current business and identify opportunities and possibilities for the future. We as designers are trained to be empathic and we can use this skill to map the users and their true needs. Moreover, we know how to link these needs with the resources and capabilities of your company, creating a closed loop with increased value for every party involved. In our co-creation sessions, we will work together as partners and go through the entire process in order to map the components of our model: the users, the key resources of your company, the key partners that are involved, the services that can be offered, key touchpoints and activities, value proposition for the users and the value proposition for your company. By using state of the art design tools and methods, we can rapidly prototype and test our ideas and clearly communicate these throughout various departments and stakeholders. If you want to achieve sustainable advantage in the future by exploring new opportunities and possibilities, Moonfish is the strategic partner of choice. Together we can achieve greatness! – Liedtka, J. (2014). Perspective: Linking Design Thinking with Innovation Outcomes through Cognitive Bias Reduction. Journal of Product Innovation Management. – Osterwalder, A., & Pigneur, Y. (2010). Business Model Generation: A Handbook For Visionaries, Game Changers, And Challengers Author: Alexander Osterwalder, Yves. – Ellen Macarthur Foundation. Circular economy. The principles. Retrieved June 13, 2014, from http://www.ellenmacarthurfoundation.org/circular-economy/circular-economy.